September 15: it would seem that market sentiment has indeed shifted towards a more bullish attitude – at least for the moment being. All major cryptocurrencies are currently seeing gains over the past 24 hours and this market-wide increase show no signs of faltering. 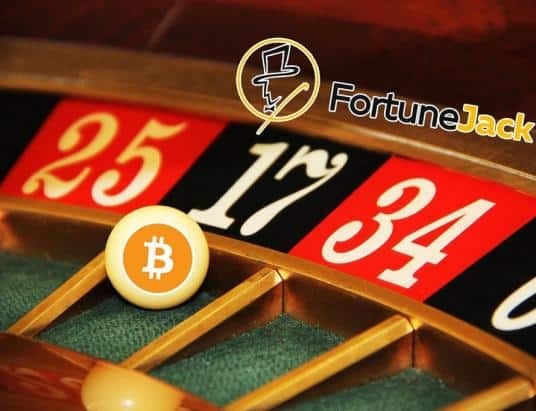 The cryptocurrency markets experienced some unstable days during last week and the beginning of this one, but it would now appear to have fully recuperated the most recent market losses. 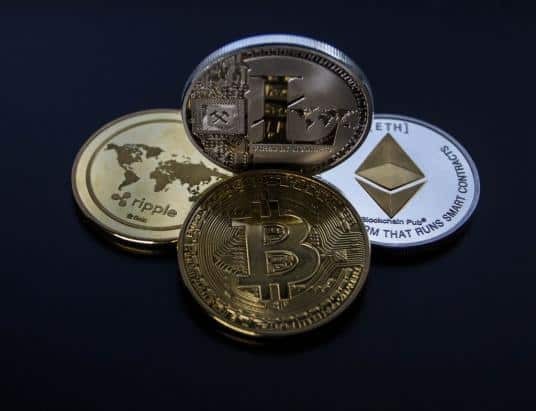 It should be noted that the cryptocurrency market is by nature volatile, and the recent gains showcase its ability to rapidly regain its value following market turbulence. 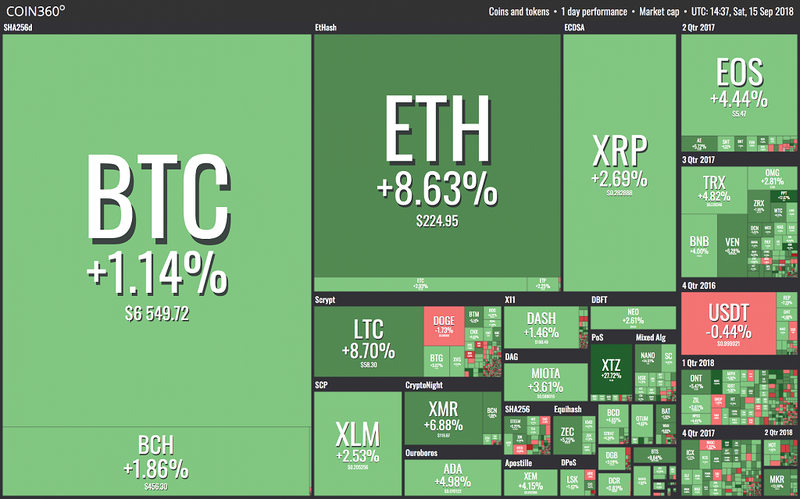 The following market visualization from Coin360 shows that essentially all cryptocurrencies are currently riding a wave of green. 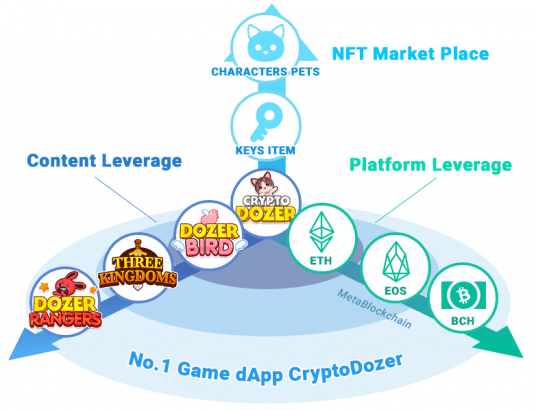 The total cryptocurrency market capitalization has also settled comfortably north of the $200 billion barrier, with the current cryptocurrency market cap at $204.7 billion at the time of writing. 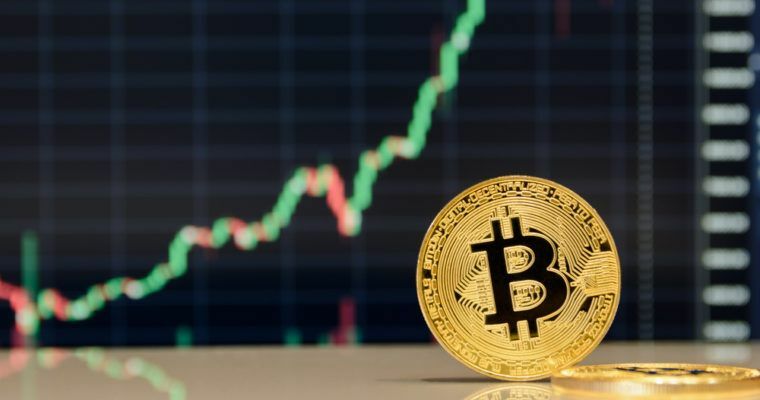 Bitcoin has not experienced any massive price gains during the past 24 hours, but has continued its steady increase – commanding a price of $6,549.53 at the time of writing, and has already broken the $6,550 line several times during the day. 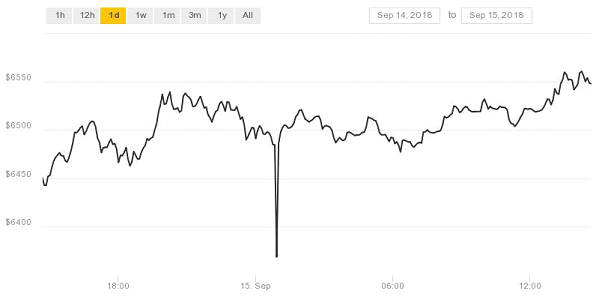 The attached chart from Coindesk shows this, and that Bitcoin has seen a slight albeit steady increase over the past day. A sharp decline can be seen taking place yesterday – presumably someone dumping a large amount of Bitcoin – but this loss was recuperated nearly instantly. 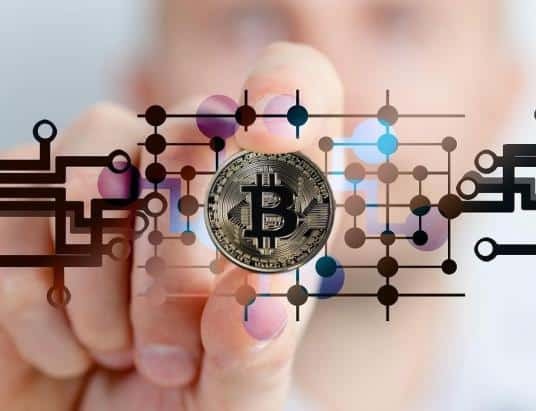 It should be noted that whilst the price of Bitcoin is still a far cry from its September 4th price of $7,349 it is now showing strong signs of recovering – even though bearish analysts predicted that the price would plummet and stabilize as low as $2,500. Ethereum, on the other hand, is seeing impressive gains of 6.20% during the past 24 hours, currently holding a price of $225. 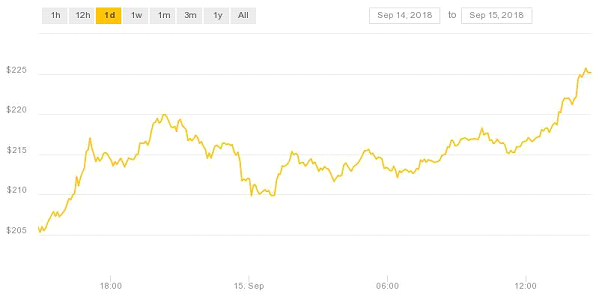 The cryptocurrency’s steady and sizable gains over the last day continues its recent upward trend in price, and its 24-hour performance can be seen in the attached chart from Coindesk. Nevertheless, the significant gains experienced by Ethereum should not come as a surprise for industry observers, considering the flurry of positive news surrounding the technology. Just now, Toshi Times covered the fresh story of how a blockchain developer and researcher has been able to code a proof-of-concept solution for Sharding, the second-layer scaling-solution promising to bring vastly greater scalability to Ethereum. Moreover, Vitalik Buterin recently commented on Ethereum, stating why he believes that the cryptocurrency has improved dramatically, a report from TrustNodes showed that September sales of Ethereum had tripled over the previous month, and it was just revealed that Ethereum’s hard fork Constantinople will be released on a testnet in October. The rest of the cryptocurrency market also sees gains, with Tezos increasing an impressive 29.22% percent to a price of $1.68, Litecoin rallying 8.04% to $58.05, and Monero similarly showing solid gains of 6.66% to a current price of $119.59. Furthermore, Stellar has increased by 2.29% to $0.205, the price of Ripple has grown 2.66% to $0.283, while EOS has increased slightly more, with gains of 4.38% to $5.47. The odd-one-out is Dogecoin, which decreased by a relatively minor 1.44% to $0.0062. 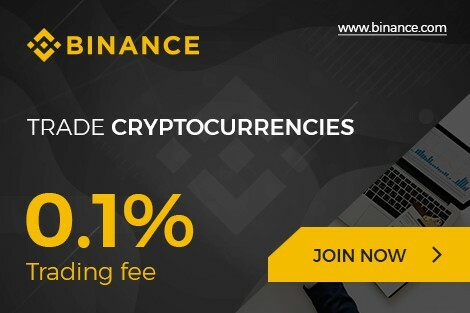 Nevertheless, the cryptocurrency market as a whole continues to lunge forward – lending some credence to the recent statement by Mike Novogratz that the cryptocurrency market has reached the bottom.